Sometimes you can have it both ways. It is perfectly possible to both regard the Welsh Rugby Union's decision to yet again award caps for a match against the Barbarians as an insult to the intelligence of the Welsh rugby public, a blatant counterfeiting of already devalued currency and a possible offence against the Trade Descriptions Act and to be delighted that Martyn Williamsis at last to get his 100th cap. And yes, I do know that Martyn won his first cap in 1996 under similar, and equally unjustified circumstances. The player himself has acknowledged amusement at this outbreak of career circularity. But there is little doubt that he would by now be well into triple figures and long-established as the first Welsh forward to attain this mark, but for a still greater greater rugby wrong, the increasingly forgotten international career of Brett Sinkinson. 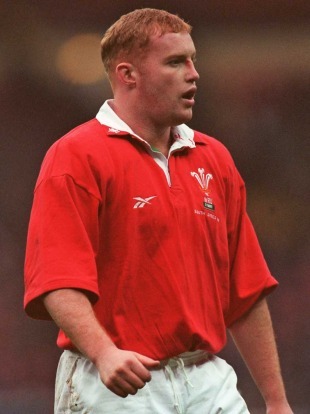 As the 'Kiwigate' scandal exposed, Sinkinson, who played 20 matches for Wales between 1999 and 2002, did so under the misapprehension that he had a Welsh-born grandfather. Investigation showed that granddad came from Oldham. The chief loser, laying aside abstractions such as the reputation and integrity of Welsh rugby, was Martyn Williams. He had been the man in possession before Sinkinson was called up, and was to regain the shirt for the best part of the decade once the whole business was shown up. He did admittedly win five caps in Welsh teams alongside Sinkinson, so was not wholly excluded. But it is a pretty good bet that at least some - certainly more than enough to make caps awarded against the Baa-Baas as irrelevant as they are wrong-headed - of the other 15 caps awarded to Sinkinson came directly at his expense. To have ended up on 99 under such circumstances would have been more than usually tantalising. And whatever you think of the merits of the occasion, it is also appropriate that he should be taking his leave along with Shane Williams. You could make a reasonable case for them as the outstanding Welsh players of the 21st century so far, sharing more than just one of our commoner surnames. They have also epitomised qualities which are essential if Wales is to be successful in the face of the greater numbers, resources and simple physical power at the disposal of most leading rugby nations. These qualities were not invariably appreciated by Graham Henry, whose recruitment policies for Wales were considerably more imaginative (if not more productive - Jason Jones-Hughes? Imported South African schoolboys?) than his tactics, which showed a preference for bulk and power over speed of thought and movement. And while Martyn was clearly more appreciated by Henry's successor Steve Hansen, we have to wonder whether Shane would ever have been seen in international rugby again but for the early scrum-half experience that gave him a useful touch of versatility as one of the last selections for the 2003 World Cup squad, followed by Hansen's decision to send out a shadow XV of sacrificial victims against the All Blacks. "Has any rugby player from any country more truly epitomised his nation as it likes to see itself?" The display that day, highlighted by Shane's devastating running, signalled a Welsh game re-finding itself. It also transformed him from outsider into the nailed-on selection he was to be - alongside Martyn - for the rest of the decade and, in his case, a little beyond. Never was their joint importance more evident than in the tipping point of the 2005 Grand Slam, the first few minutes after half-time in Paris. France had led 15-6 at the break and it would have been no real injustice had their lead been 25 or 30 points. Gareth Thomas had gone off with the injury that ruled him out of the remaining two and a half matches. The try within four minutes of the re-start, initiated by Stephen Jones and scored by Martyn after a dazzling interchange with Shane, epitomised their qualities - heads-up, thinking, creative rugby - seeing and opportunity and seizing it with wit, rapid movement and precision. There's a good case that that season, when he was just short of 30, was Martyn's peak, in a terrific back-row combination that also incorporated Ryan Jones's early gain-line incisiveness and the handling skills of Michael Owen. Too bad it was so short-lived as a unit. Of course you could argue that appreciation of Martyn was aided, like many a fine back-row, by a distinctive hairdo. But that also means you get noticed when you are in the wrong place or do the wrong thing, and there were very few recorded occasions of the mid-career Martyn doing either. Instead you saw a player with the instinctive positional sense of the high-quality footballer and the gift for support running and maintaining continuity of the classic number seven. It was recognition of the value and relative rarity of those skills that led Warren Gatland to one of his best decisions, persuading Martyn out of a very brief international retirement at the end of 2007. Gatland hoped he might get 18 months or so out of his veteran. He got twice that, and might well have asked for more but for the emergence of Sam Warburton as a loose forward whose gifts and style are perfectly suited to the modern game. Shane, of course, reached his peak under Gatland in 2008, a year in which his sublime skills seemed to have been supplemented by the ability to defy gravity. And while he eventually reverted to human form, the sequence of 'last match' tries has suggested that the gift for the remarkable and the brilliantly theatrical has lasted to the very end. Ok, so you might discount last-gasp scores in an inconsequential already-lost international and an already-won match against the Dragons, but two match-winning scores - the last with your final touch - to steal a trophy away from a highly determined bunch of European champions on their own ground? Much more than theatre, that was simple, incomparable class as a maker and taker of try-scoring opportunities. Of course we can all recite the numbers and speculate that just as Henry's unqualified imports might have cost Martyn his 100th cap, his and Hansen's predilection for powerful centres rather than elusive runners on the wing helped preserve Daisuke Ohata and David Campese's place ahead of Shane on the all-time try-scorers lists. But much more important than the bucket-load of tries is what Shane meant to Welsh rugby. Has any rugby player from any country more truly epitomised his nation as it likes to see itself? The little guy, whose wit and speed and thought of movement take him places larger, more cumbersome men cannot go, making flat-footed fools of powerful adversaries in the process. It is, as Dai Smith and Gareth Williams pointed out more than 30 years ago in Fields of Praise, a matter of self-image, an aesthetic and also a matter of practicality. And those practicalities remain. For all of the evident success of the WRU's genetic programme for 'Unfeasibly Large Wingers', Wales is always likely to be at a disadvantage against most other leading nations in terms of simple physical power. Compensating qualities have to be found. It would of course be a mistake to assume that the darting gamin winger and the classical, comparatively lightweight, footballing open side are the last of their kind. Not least of rugby's virtues is that it does not develop in straight linear terms. Rule changes, outstanding individuals and smart adaptation to opposition over-emphasising brawn at the expense of brain could all in time generate fresh successors to the shining traditions they represent. We must certainly hope so, for the sake not only of Wales but the wider game as a whole. If it becomes purely the preserve of the giant and the gymrat, quite a few of us will be looking for different forms of sporting entertainment on weekends between September and May.